Next topic will be cobbler aprons (tabard aprons/smocks). 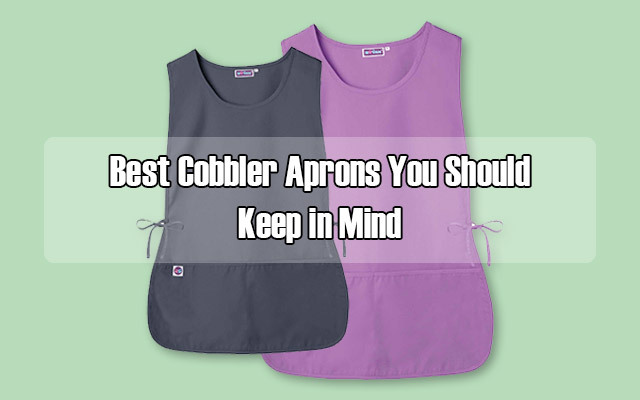 If you wish to have an easy-care, easy-use apron for everyday task, cobbler aprons are highly recommended. Most of the aprons I’ll be listing in this article doesn’t require too much attention to take care of, they are relatively cheap, and the fabric is really nice. So, no more discussion, let’s start! First cobbler apron in the list is from VEEYOO. VEEYOO introduces to you a series of cobbler aprons with pockets in 10 different colors: burgundy, forest green, light taupe, mustard, navy, orange, red, royal blue, slate, and white. 2 sizes M and L are available for your wide selection. These aprons are made from 80% poly and 20% cotton, yes, the material quite stiff. 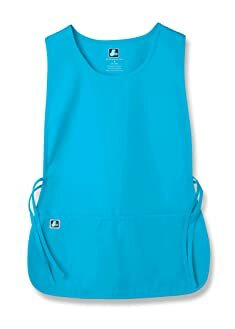 Adjustable side straps help you adjust the size of the aprons according to your body size. The only part that you can’t adjust is the neckline but in general, it is large enough for you to feel comfortable with that, and especially, VEEYOO have 2 sizes for this apron: medium with the measures of 20”x28” and large with the measures of 23”x32”, so overall, don’t worry about the size. Come along with 3 deep front pockets, each pocket is measured 7”x10”, the aprons are practical for you to keep electronic devices, holding treats and grooming tools while you do your task, whether you’re gardening, crafting, or cooking. You can also use them when taking care of babies, it will work fine. Care instructions are also quite easy, you can wash them in the washing machine with cold water and gentle cycle, tumble them on low. If needed, you can also bleach them but make sure that the bleach doesn’t contain chlorine, and lastly, light ironing is recommended. Adar Unisex brings use this massive collection of solid color half apron with pocket. There are 30 different colors for you to choose from. This sleeveless cobbler apron is made from 65/35 polyester/cotton which is durable through time. 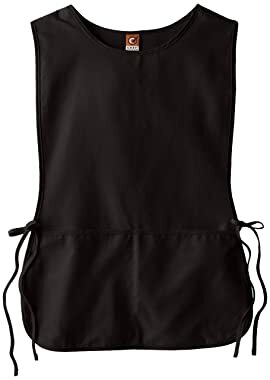 It’s 27 ¼” for size regular with 2 adjustable straps on the sides that fits perfectly on both men and women and they don’t ask you a lot of effort to wear it like you have to for the AmeriMark apron that I’ve described above. 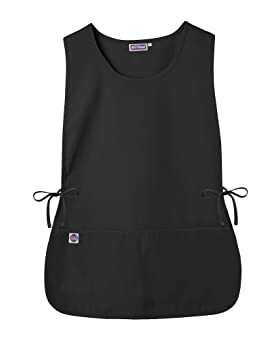 I highly recommend this apron because its solid color and design makes you look neat when you wear it and it’s not picky about its users: both men and women, children and adults, the young and the older, all look nice in it. This Sivvan unisex cobbler apron promotes what you call classic and convenience. 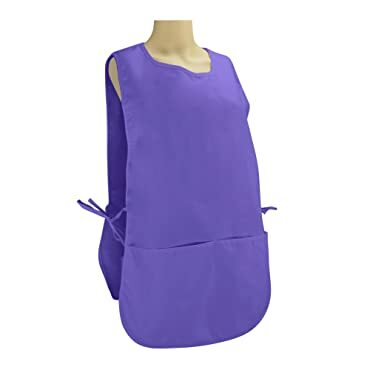 This collection of 16 colors cobbler aprons (black, navy, burgundy, Caribbean blue, ceil blue, charcoal, hunter green, khaki, lavender, mandarin orange, purple, red, royal blue, sherbet, teal blue, and white) in 2 sizes including regular and large gives you such a wide selection. Some colors such as mandarin orange, red, or royal blue are bright and cheerful that make you smile seeing them. The apron is designed to be comfortable enough so that you can just leave the strings on the 2 sides tied, and you it like a T-shirt so that you don’t have to tie and untie them all the time. Your clothing is well-covered while the slit sides allow you to move your arm freely. I highly recommend this apron for men and even those who are big and find it difficult to choose the fit apron. This is made from 65% polyester and 35% cotton which explains why it’s very durable. Nicely designed with full coverage of the front and back helps you to protect your clothing completely from stains, splash, or cuts. The apron comes with 2 deep front pockets which perfectly designed for keeping tools and phones, or even tablet while doing your work. It’s also very lightweight which means it doesn’t add up any weight while wearing it besides your tools that you keep in the pockets. You can purchase them in the set of 3 so that you will always have at least one available apron while the others are in the washing machine. Chef Designs is specialized at creating chef’s cloth such as chef’s coat, chef’s pants, cook’s shirt, or hat. 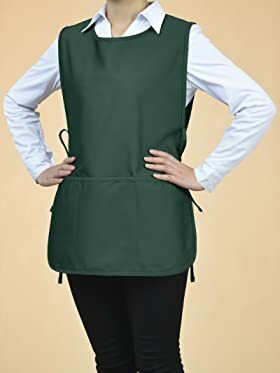 Yes, regarding cobbler aprons, they introduce to you the collection of 7 colors of cobbler aprons including black, navy, Kelly green, light blue, red, royal blue, and tan. These aprons are made out of 80% polyester and 20% cotton. They are made in pretty good material, very sturdy and durable. You can also use it for service where there’s a lot of bleach. It doesn’t require too much of caring. It’s machine-washable and can be dried in the dryer, too. They have those common features of cobbler apron such as adjustable ties, front and back cover with two deep front pockets to keep tools that you can’t work without, which keep the mess away from you while having the tools close at hand. Sizes include large and medium. For the large size: it’s 30 inches long from shoulder to hem and about 22 inches wide. The medium size is around 25 inches long and 19 inches wide. It will just stop right in the hip area or your upper thigh. It’s also lightweight and comfortable. The neckline high enough to protect your chest perfectly while the sides wrap nicely around waist and armpits. Bear in mind that when you keep your stuffs in the front pockets, the apron may slide forward which makes the apron a little bit longer than usual, you might want to consider buying a smaller size so that you can reach the bottom of the pocket while keeping a lot of stuffs in it. Joining in the list is the cobbler apron (smock) from DALIX. It’s made from 65% polyester and 35% cotton. The material is well-weighted, not too light but not too heavy, sturdy enough for you to feel comfortable in it. If you’re looking for a high-quality apron with cheap price, this is it! It also doesn’t require a lot of special care, you can easily wash and dry it with machine, it won’t fade out, and yes, no ironing is needed. This one-size-fit-all design is measured at 28 inches in length and 18.5 inches in width with adjustable ties on the 2 side, which will be well suited no matter what size you are. There are 7 different colors are available, including dark green, black, purple, navy blue, white, red, and striped black and white. Bonus point is that they’re designed in mostly solid colors which make it easier to imprint and highlight your company’s logo on it. It also has 2 spacious front pockets (8.5” x 9”) which is perfect for you to keep necessities such as pens, phones, notepads, cleaning gloves, or even spatulas. The aprons can be used for serving, cleaning, cooking, or crafting. They will work fine with all kinds of tasks. You can also use it as a bib you want to enjoy a show while eating. You can purchase these aprons in 1 pack, 2 packs or 10 packs for a set depends on your intention to use them. Last apron in the solid color list is belong to Uncommon Threads cobbler apron. First impression about this apron is its shiny look. There are 5 different colors which is black, brown, hunter (green), royal (grey), and white. The prices are also various, from $12.68 to $18.00, depends on which color you choose. It’s made from 65/35 poly cotton. It’s pretty light, 7.5 ounces, but sturdy and durable, perfectly fit for daily use. It’s absolutely fine if you want to wash and dry it with machine. The fabric is awesome as well as practical, you would want to use it in a long time. The size is measured at 28 inches long and 20 inches wide with extra-long side ties (40 inches) allowing you to adjust according to your body size. There are 2 large pockets in front which are deep and spacious so that you can keep your implements in them in your hand’s reach. One great idea is that you can use this apron for your mom and grandparents to keep their phone in emergency cases. That would be very helpful! Opromo joins the competition with this well-made apron in 5 solid colors including black, dark green, Kelly green, red, and royal blue. It’s made 80% from polyester and 20% from cotton twill fabric. It’s machine washable and perfectly suitable for hair stylists, daycare workers, and store staffs. It measures 19 inches wide and 28 inches long. It has side ties closure one 2 sides. The apron comes with 2 deep front pockets which measure 9 inches in both length and width. There are 2 aprons for a package and the price displayed is also for 2 aprons. Sometimes you would find out that it doesn’t really matter how the aprons look like but how practical they are. And you can only feel it once you actually put it on and do your work. Opromo doesn’t come with any appearance-uniqueness, but the apron is good in its quality, in how well it is made and how sturdy and durable it is when you wear it. A cobbler apron is a good idea for those who like tidy style, this is the one you’re looking for. 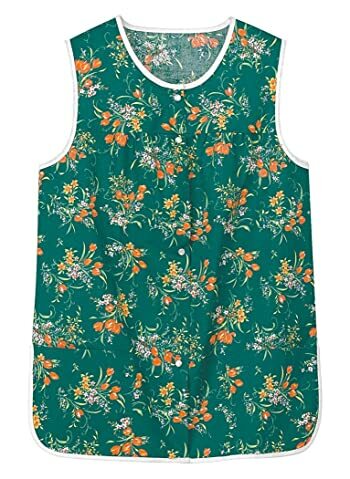 This AmeriMark patterned cobbler apron is like a floral shirt with front buttons. There are 9 different designs, so you can choose the one that show your personality. Keep in mind that this is not a long apron that can cover your knees, its length is just right in the same level of your normal shirt. Since the design is floral, it may be a bit picky for users. Normally, old women love these designs. There’re full sizes for both adults and children so it will be really nice if you wish to have couple apron with your mom. The price is various depends on sizes and designs but it’s relatively cheap, from $12 to $14 per piece. One thing that draw back the customers is the snaps sometimes require a lot of effort to close which is not really convenient. 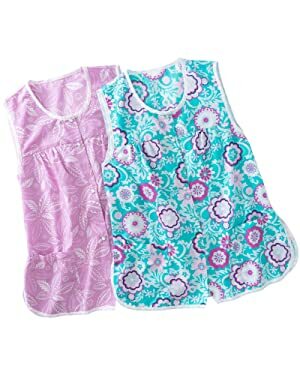 This set of 2 snap front cobbler aprons will put a smile on your face when you see them in the kitchen. With bright color designs and lively patterns, this set deserves to be saved at last as the best aprons I would recommend. They are made out from cotton and polyester with the ratio of 55-45. The material is very sturdy when you wear them. These aprons are easy to care, you can wash and dry them with machine, no special instructions for this. They are so practical in any task performance such as gardening, cleaning, or cooking. With the front snapped, your clothing will be perfectly protected. Coming along is 2 side pockets that are convenient for you to keep tools and notes while performing tasks. Those who are small and looking for a fit apron, these are the ones. Normally, one-size-fits-all aprons that are very common in the market are too big for you. They are also designed with generous armholes allowing you to be comfortable doing your work. Granada Sales is so good at making long-lasting aprons. 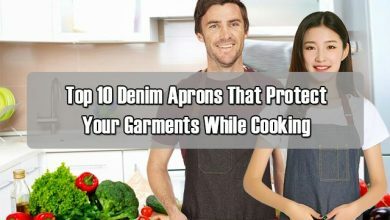 They can last for more than 20 years, of course it will be worn out a little bit for faded away a little bit but overall, the aprons stay usable and practical. Just bear in mind that small size is available, it’s around 32 inches long from shoulder to hem bottom, well suited to those who are small (size 12 to 14). 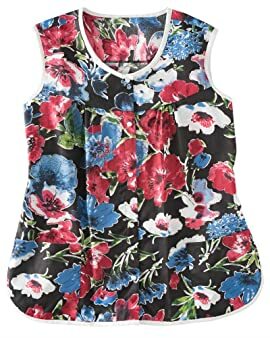 The last apron I would like to introduce to you is this floral cobbler apron from Metropolitan. It is made from 45% polyester and 55% cotton and it can be washed and dried in machines. 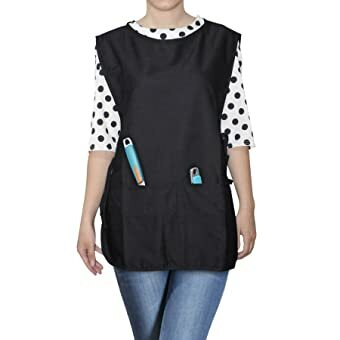 This smock-style sleeveless apron is designed with full snap front and 2 patch pockets on 2 sides of the apron so that you can keep your pen or phone in handy. There are 3 sizes for misses which are S, M, L, and 3 sizes for women which are 1X, 2X, and 3X. The misses’ size is approximately 27 inches long and women’s size is 29 inches long. It’s very well weighted. Some of you might prefer light weight apron and some like heavy weight, this apron is just right in the middle of that, but the most important thing is it’s sturdy and thick enough for you to feel comfortable and well-covered while using it. For this apron particularly, that would be very nice to give it as a gift for your mom or grandma. It is such vintage and women-like apron. 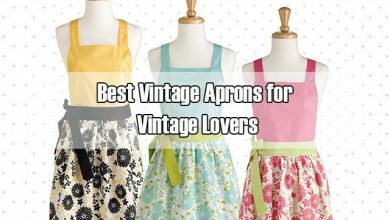 Now, it’s your turn to pick the best aprons for yourself, family, friends, and workplace! Wish you luck and hopefully this article is helpful for you.